My search for picture books that portray the power of fathers to foster empathy with nature. I recall from my childhood that the sight of a fly in the kitchen would put my city-raised mother into “Rambo” mode. She would take command, wielding the fly swatter with precision, offering no forgiveness to any insect that would cross the threshold into the tabernacle of cleanliness that was her kitchen. And then there was my dad, strong and protective, who blew me away one day when, all at once, he cupped his hand, caught a fly, and quietly walked to the screen door and released it back to nature. This was my first “Story of the Earth” told to me by my father without his uttering a single word. Pushing against gender norms, he modeled for me (and my brother) throughout his life, the most kind, gentle and respectful interactions with nature. The strong father figure who “couldn’t hurt a fly” was a profound image that determined my life-long relationship with the natural world. 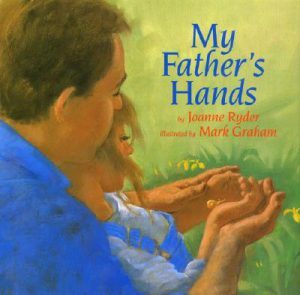 Now, with that bit of personal history in mind, imagine my delight when I discovered a beautiful picture book portrayal of the father/child/nature relationship entitled My Father’s Hands. 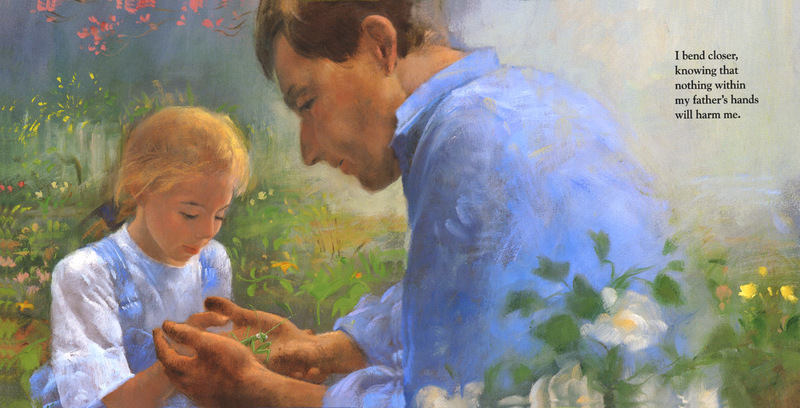 Author Joanne Ryder fashioned this story after her own father, “a thoughtful, gentle man who opened doorways of wonder for her by holding tiny creatures in his hands and helping her discover how unique and marvelous each one was.” In My Father’s Hands Ryder portrays a gardener who wordlessly conveys his love for nature to his daughter as she narrates, “. . . nothing within my father’s hands will harm me.” Illustrator, Mark Graham, uses closeups of faces and hands throughout conveying the emotional spirit of the father/daughter/nature relationship. My Father’s Hands is on my gift giving list for new fathers, as is Jane Yolen’s classic, Owl Moon. These books are empathy primers. In each, the storyline gives weight to the father’s key role in fostering sensitivity and understanding in the child for all sentient beings. Fathers, sons and nature – Picture book portrayals of fathers and sons in nature favor images of paternal bonding, such as fishing or camping with dad. Wishing I Was Fishing by Eva Wells, and Fishing in the Air by Sharon Creech and Chris Raschka, are two examples. Father/son books like these message an awareness or sometimes an appreciation of nature; but a peaceful interface that stirs empathy – not so much. Anthropomorphic stories – Tales of animal dads and animal kids appeal to the youngest children and can evoke a loving connection to nature. 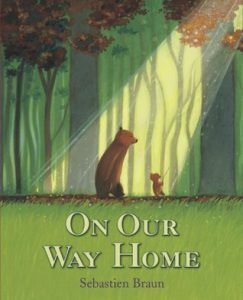 One example is Sebastien Braun’s On Our Way Home, a nicely illustrated bedtime story of a bear and his cub on a walk home through the woods, racing and resting and gazing at wonderful things on the way. City Dads – The father/daughter planting project in Eve Bunting’s Flower Garden brings attention to how even small slices of the natural world can be shared and valued by parents and children in an urban setting. Some conclusions – The image of a father who values the beauty and wonder of the natural world and shares his passion with his child is powerful – in real life and in picture books. Anthropomorphized stories of animal dads and animal children appeal to younger children and may stir the beginnings of empathy. Realistic, well-illustrated stories of empathy are few in number, and favor the father/daughter/nature relationship. I hope to learn of more picture books that portray how fathers share their passion for nature with their children. Please use the comment box to share your thoughts or to add to my search.